New Jersey should put a down payment on the promise of preschool made to thousands of young children in the state’s 2008 school funding law, according to a new report released today. Advocates for Children of New Jersey called on Governor Chris Christie and the state Legislature to begin funding expansion of high-quality preschool that would provide thousands of young learners with a jump start on their education, increasing their chances for school success. New Jersey’s school funding law mandates high-quality, full-day preschool to be fully funded by state dollars in districts across New Jersey that have high concentrations of children living in low-income families. Other districts with fewer low-income children are supposed to receive funding to provide preschool to some young students. Since 2008, only four districts have received these expansion funds. To measure the need and the will to expand preschool to all eligible children, ACNJ surveyed more than 100 districts that currently receive limited preschool state aid. The majority of these districts have high concentrations of children living in low-income families who would most benefit from high-quality, full-day preschool. Administrators in 46 of these districts completed the survey. The survey found that 82 percent of these districts are ready and willing to expand their preschools so that more children reap the proven benefits of preschool and to meet the high parent demand for this quality early learning, the report said. 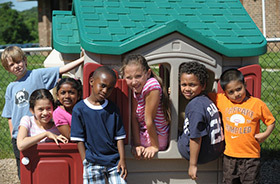 “Research indicates that full-day preschool is most beneficial and, given the economic disadvantage of our population — 54% eligible for free- and reduced-price lunch – we could better serve the needs of more preschool children in the district with a full-day program,” said Peter Koza, superintendent in Upper Deerfield Township. The report also looked at whether preschool has had a positive impact on children in the four districts – Fairfield, Little Egg Harbor, Red Bank and Woodbine — where expansion has occurred. These districts reported that young students are now better prepared for kindergarten, both academically and socially. They also reported a decrease in the need for special education and increased opportunities for teachers to hone their skills in teaching young children. “Early childhood has been the lynchpin of our education and has propelled us,” said Little Egg Harbor Superintendent Frank Kasyan. ACNJ called for a $10 million down payment that could be used to expand existing preschools from half- to full-day, create new preschool classrooms to serve children who currently are not attending high-quality preschool or a combination of both. “As budget discussions get underway, we urge the Legislature and Governor to view this as a critical investment in our children’s education – one we can no longer afford to delay,” Rice said. View elevator speech on why #Census 2020 is important and get media coverage on yesterday’s rally.